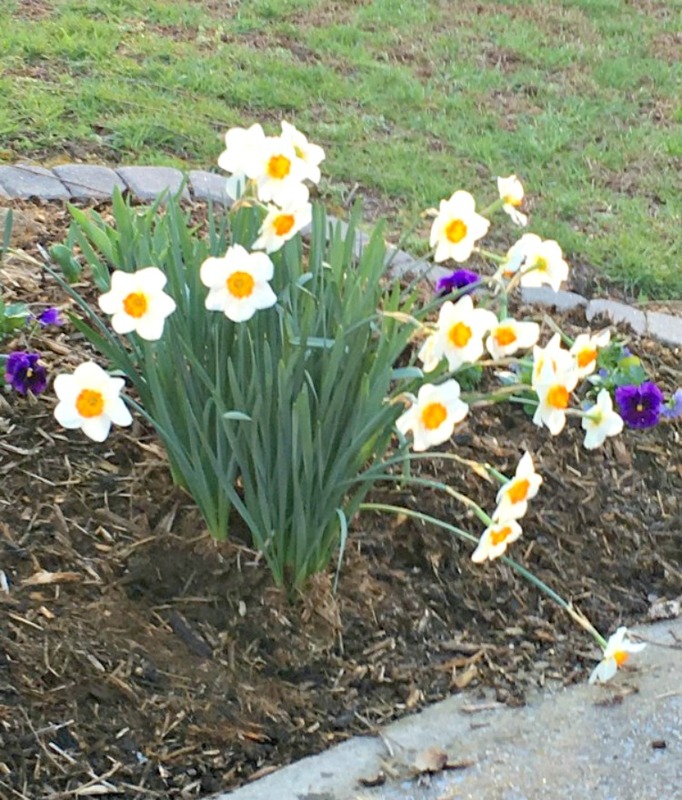 Springtime is here in Tennessee. Forsythia and daffodils are blooming, trees are budding, and there’s warm sunshine peaking through the clouds most of the time. Oh, and allergy season has hit most. Yes, spring is here. 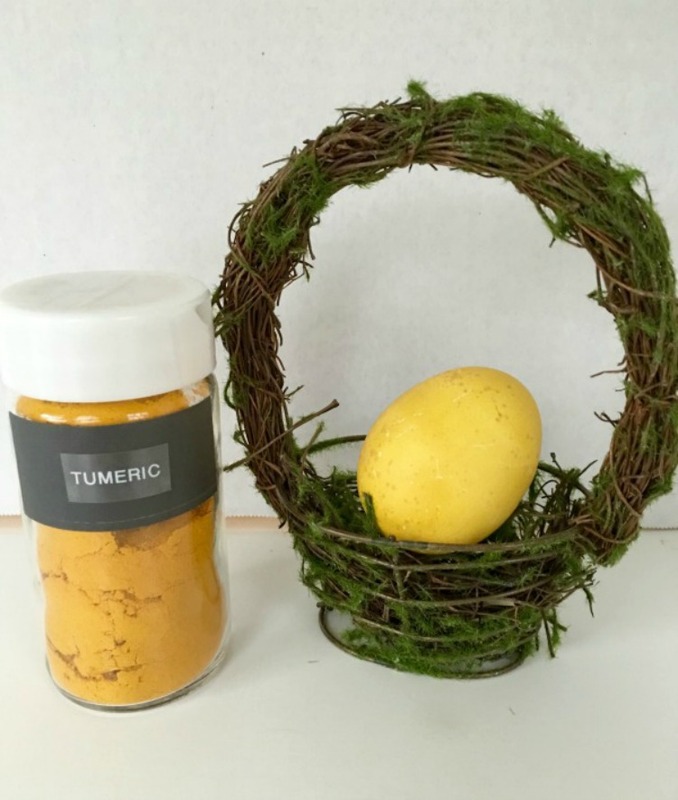 So off to make my Easter eggs dyed with coffee, tea, and turmeric. 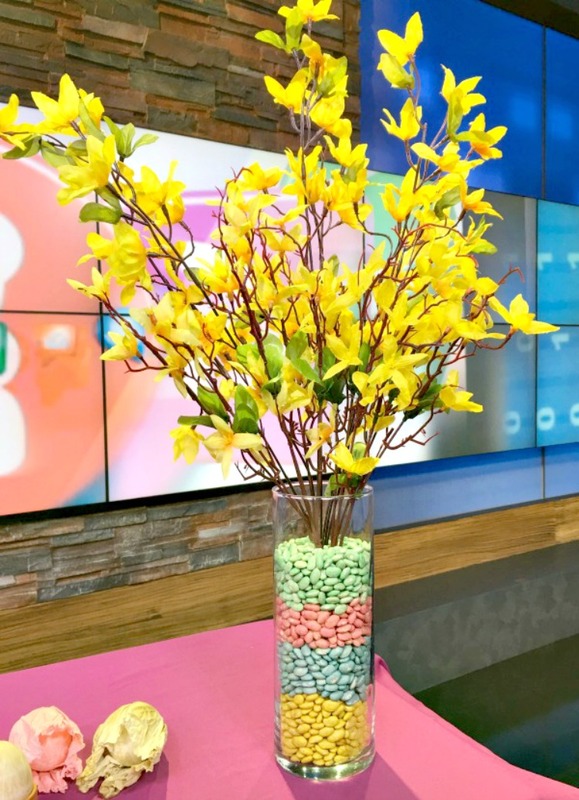 I normally don’t decorate a lot for “Easter” as much as spring. I remember the days when Doug was young the house looked like Easter threw up. And I even had eggs hanging from the trees in the front yard. Yes, Don was not happy about that project, but being the good husband he is, he went along with it. Although the colors usually associated with spring are pastel but Easter eggs tend to be bright, I wanted something a bit different. I’m going for a more neutral color tone this year. Grays and whites are so dominant in decorating, I thought I would go with natural colors. 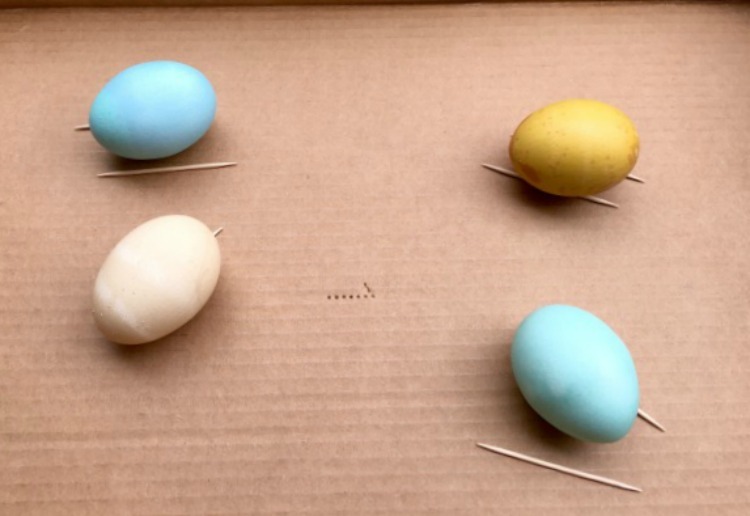 So now how to dye eggs to fill a basket and nests. 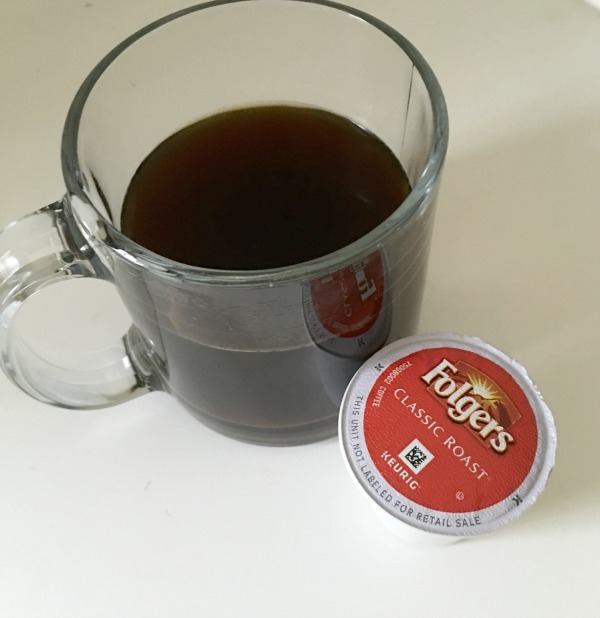 Coffee and tea should do the trick. I always have food color on hand so if I decided to add any “colors”. And, I’ve been seeing a lot of natural food coloring which I did try. I’ll go ahead and let you know about the fails. After boiling a couple dozen eggs as usual, I let them cool and dry. These aren’t going to be eaten so I didn’t worry about refrigeration right away. But if any cracked during these processes they were tossed. I saw people using spinach and zucchini for pretty green. NOT for me. I cooked each of them separately, let them cool, added vinegar, ……….. and so on but barely any color to my eggs. Now to those which worked for me. Turmeric did work great. I loved the golden yellow it produced without it being that typical yellow. Stir well and let this set til almost cool. Add eggs and let set overnight. There is some spice which settles to the bottom but you can stir it off and on if you want to. This might have caused a few of the speckles, but it was fine with me. All had 2 teaspoon vinegar added. There is a bit of a difference in the browns of the tea and coffee. Tea gave a more beige color. These weren’t being done with any color expectations, so I was happy with the results. And there’s always differences in eggs too – all of these were in coffee grounds for about 5 hours and there is noticeable color variations. These were done with just a cup of hot water, a few drops of food color and vinegar. I don’t have my exact ratio of food coloring since it was just an experiment. I would say though maybe 4 drops of blue and 1 drop of green. They only stayed in the dye about 5 – 10 minutes. If they aren’t dark enough or the right shade, just add another drop or two of food coloring and let set again. Remember, most of the time it’s not like you are trying to match paint colors. I wanted to have a variety of looks so decided to speckle some and this is where my experimenting was done again. Do this outside or an an area well covered because paint can splatter. 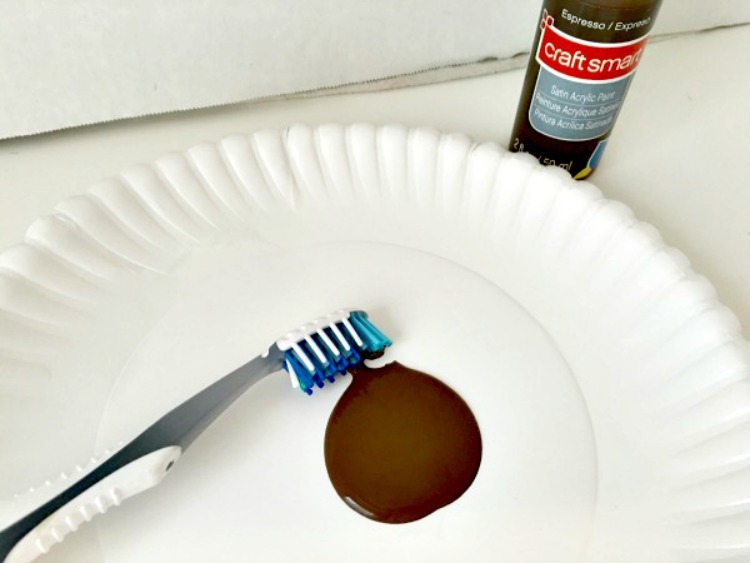 Pour a small amount of paint onto a paper plate and dip the tooth brush in. To keep the eggs from rolling around, I made a “‘stop” with toothpicks. 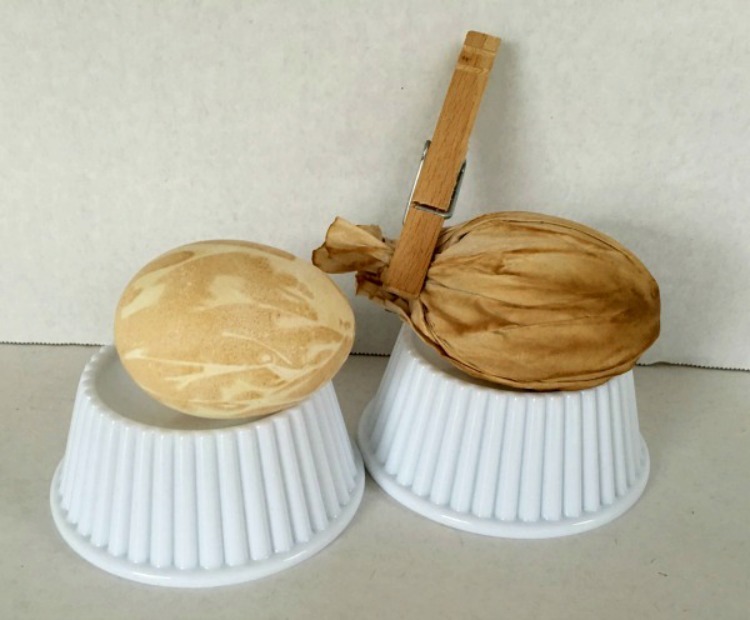 Flick the end of the tooth brush with you finger aimed toward the egg. Add as much speckle as desired. Let dry completely. Do reverse side if desired. 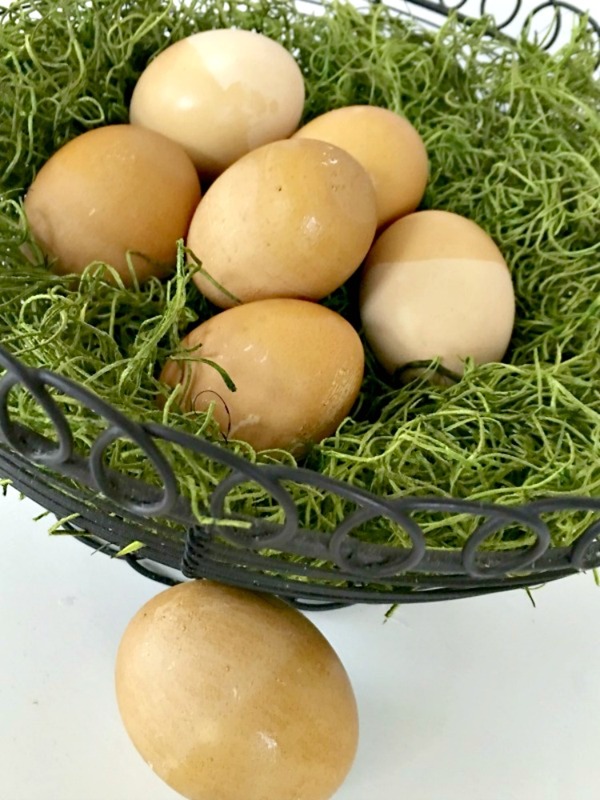 Hint for dipping eggs into dye – especially useful with kids. 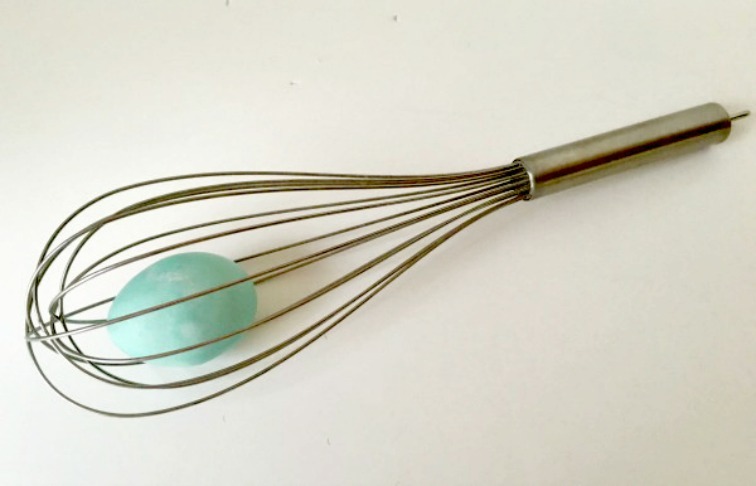 Place your egg inside a whisk to dip into dye. Just be careful when they remove the whisk from the dye to not shake it to briskly as they will splatter the dye, or break the egg. After dyeing the eggs I thought – what else could I do with this coffee. I used a couple of regular coffee filters and dipped them in the coffee until saturated, then wrapped it tightly around the egg, pressing out extra coffee and air. You might want your gloves on for this too. The filter needs to lay as flat to the egg as possible. Top was twisted and secured with a clothes pin. This could work with any color dye. Now show me some of you favorite Easter and Spring Projects. 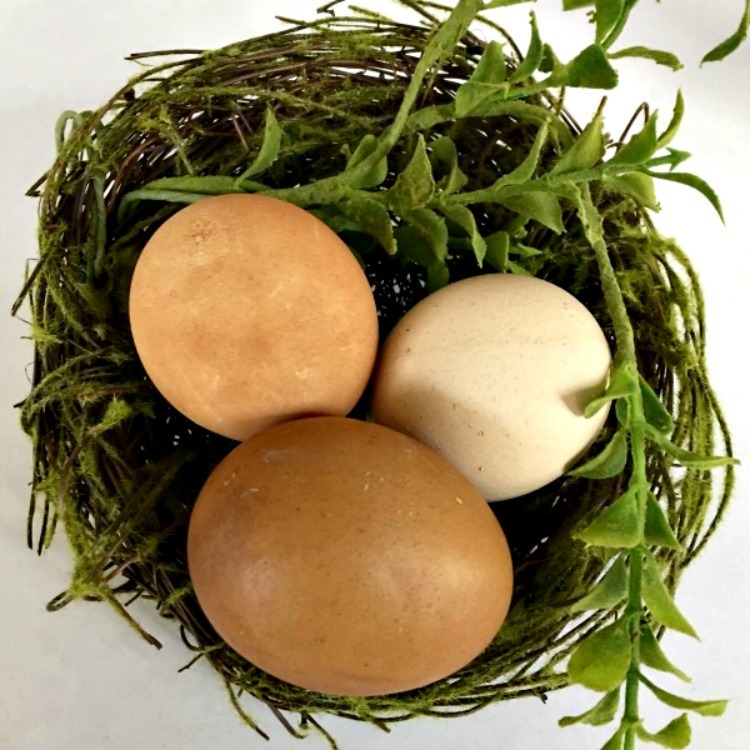 I’m loving my Easter Eggs Dyed With Coffee, Tea, and Turmeric and may keep them out a little past Easter. Do you need a filler for vases? Beans will do the trick. I loved reading this post. My uncle used to dye eggs with the skins of red onions. Miss getting those eggs! I tried a couple things, I think spinach and something else, and just couldn’t get it to work. But I was pleased with these. Such cool ideas! 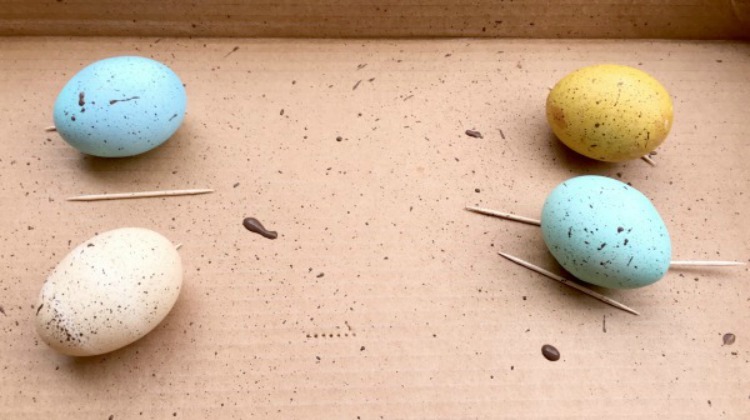 I love that you have found so many ways to work with Easter eggs. I love the coffee and tea eggs. They look so natural. Really cool. Really easier and less mess. Put them in and let them set for a while and you’re done. Because we don’t eat these, I don’t worry about them sitting in the coffee or tea for a long time. I love the colors. Great tips! Love the natural way of dying eggs best. Happy Easter! Thanks so much. Sometimes I’m just not into a lot of color and loved how these turned out. Lots of great ideas here Rosemary. I have also been wanting to steer clear of the store bought dyes and try my own. It’s too late for this year, but I really want to try with the vegetables again as I couldn’t get it to work before.